SEATTLE--(BUSINESS WIRE)--Apr. 2, 2014-- (NASDAQ:AMZN)—Kindle revolutionized reading by making it possible to think of a book and be reading it in less than 60 seconds. Kindle Fire put the world’s largest selection of movies, TV shows, songs, apps, games, books, audiobooks, and magazines in the palm of your hand. In each case, Amazon integrates the hardware, software, and the content into an easy-to-use, seamless, end-to-end service for customers. Today, Amazon is excited to unveil its newest innovation—Fire TV, a tiny box that plugs into your HDTV for easy and instant access to Netflix, Prime Instant Video, Hulu Plus, WatchESPN, SHOWTIME, low-cost video rentals, and much more. Fire TV also brings photos, music, and games to the living room. Meet Amazon Fire TV at www.amazon.com/FireTV. Voice search that actually works—simply speak the name of a movie, TV show, actor, director, or genre into the remote, and you’re done. No more hunting and pecking in an alphabet grid. All the content—instant access to Netflix, Prime Instant Video, Hulu Plus, WatchESPN, YouTube, and more, plus the largest selection of videos for rent and purchase—over 200,000 movies and TV episodes from Amazon Instant Video. Plus, listen to music with Amazon MP3, Pandora, iHeartRadio, TuneIn, and more. Powerful performance in a tiny form factor—quad-core processor with over 3x the processing power of Apple TV, Chromecast, or Roku 3, a dedicated GPU, plus 4x the memory of Apple TV, Chromecast, or Roku 3 for exceptional speed and fluidity. Delivers stunning 1080p HD video and immersive Dolby Digital Plus surround sound. All of this comes in an incredibly small package—Fire TV is 0.7” thin and comes with a simple and sleek remote control with a built-in microphone. Simple and easy to use—arrives pre-registered so you can start watching immediately out of the box. An exclusive new feature called ASAP (Advanced Streaming and Prediction) predicts which movies and TV episodes you’ll want to watch and buffers them for playback before you even hit play—instant start. High-quality, low-cost gaming—games like Minecraft, Monsters University, The Game of Life, The Walking Dead, NBA2K14, Asphalt 8, Riptide GP2, Despicable Me: Minion Rush, and more. The average price of paid games on Fire TV is $1.85. Play using your Fire TV remote, the Fire TV app for smartphones and tablets, or the optional Fire game controller. Amazon FreeTime revolutionizes parental controls—parents can choose what their kids see and set time limits for types of content and times of day—no more negotiating for one more show before bedtime. Customers who subscribe to FreeTime Unlimited—Amazon’s all-you-can-eat content subscription designed for kids ages 3 to 8—will get unlimited access to thousands of movies and TV shows. X-Ray for movies, TV shows, and music—see information about cast and crew, trivia, goofs, and synchronized lyrics. See all of your photos and personal videos come alive on your big-screen TV—seamless integration with Amazon’s Cloud Drive. Fire TV features a world-class quad-core processor with 3x the processing power of Apple TV, Chromecast, or Roku 3, and a dedicated Adreno 320 graphics engine that processes 57 billion floating point instructions per second, for lightning-fast graphics and excellent fluidity. Fire TV comes with 2GB of memory, 4x the memory of Apple TV, Chromecast, or Roku 3, so content loads faster and games run smoother. With dual-band, dual-antenna Wi-Fi, Fire TV streams in up to full-HD 1080p and supports HDMI and optical audio-out, enabling up to 7.1 Dolby Digital Plus surround sound. Fire TV comes automatically pre-registered so you can immediately get started. No complicated set-up, no hassle—just plug it in and start watching. All of your previously purchased movies and TV shows from Amazon, as well as personalized recommendations and your Watchlist, will be there waiting for you when you turn on Fire TV. Fire TV is designed to disappear. It is 0.7” thin, so it is easy to hide, and is silent even when running the most demanding applications. Fire TV’s remote is small, simple, and intuitive, with familiar controls. Search, browse, play, pause, and add titles to your Watchlist with ease. The Fire TV remote uses Bluetooth so there is no “line of sight” required, which means no reaching or struggling to aim your signal at a tiny target—store your Fire TV in a cabinet or behind the TV. Gone are the days of searching for a movie or TV show by left-left-down-right-ing through an on-screen alphabet grid using your remote. Simply speak the name of a movie, TV show, actor, director, genre, app, or game into the remote, and the results will appear instantly. Voice search leverages the search data and expertise of Amazon.com and IMDb, and is optimized to understand Amazon’s video, app, and game catalog. Fire TV comes with instant access to all of the most popular subscription video services, including Netflix, Prime Instant Video, Hulu Plus, WatchESPN, VEVO, SHOWTIME, Crackle, YouTube, and more, with additional services like WWE Network, MLB.TV, WATCH Disney Channel, WATCH ABC, and Twitch coming soon. 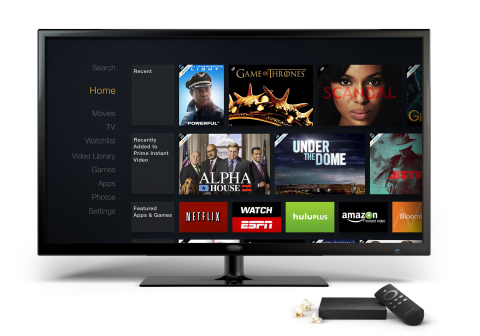 Fire TV is seamlessly integrated with Prime Instant Video, Amazon’s subscription streaming service. With tens of thousands of movies and TV episodes, Prime Instant Video is the exclusive premium subscription streaming home for thousands of hours of video, including shows like Downton Abbey, The Americans, Workaholics, Justified, 24, Hannibal, Dora the Explorer, SpongeBob, and more. Prime Instant Video also includes shows from Amazon Studios, the original TV production arm of Amazon, such as Alpha House from Pulitzer-Prize winner Garry Trudeau and starring John Goodman, which debuted last year and quickly became the most watched show on Amazon since its release. Alpha House is now in production for its second season, and Amazon recently greenlighted six new shows, including The After, Bosch, Mozart in the Jungle, and Transparent, which will be available starting later this year. Rent or purchase over 200,000 movies and TV episodes from Amazon Instant Video, which has the world’s largest selection of videos to rent or buy, including new releases and blockbusters. Amazon is the only nationwide video service that offers rental and purchase, as well as a subscription streaming service, so you can find everything you want in one place—catch up on past seasons of popular TV shows with Prime Instant Video before purchasing the most recent episode of the show as it’s released. Just like on Amazon.com, Fire TV integrates viewing options on a single page so you can always choose the lowest price. This is available starting with Hulu Plus, Amazon Instant Video, and Prime Instant Video, and will expand to other content providers so you’ll see all of your options in one place. You shouldn’t have to wait 10 seconds for a video to buffer after you press “Play”—it should start immediately. Based on your Watchlist and recommendations, the new ASAP (Advanced Streaming and Prediction) feature predicts which movies and TV episodes you’ll want to watch and prepares them for playback before you even hit play. This feature is smart—it is personalized based on your viewing habits and adapts as those habits change. The caching predictions get better over time, so ASAP will continuously improve as you use Fire TV. Fling Amazon TV shows and movies from your phone or tablet to your Fire TV using Second Screen. This turns your TV into the primary screen and frees up your phone or tablet to provide playback controls, a customized display for X-Ray, or simply a place to email, browse the web, and more, while you watch a movie. Second Screen is available on Kindle Fire HDX and will be available later this year from your iPhone or iPad. You can also wirelessly mirror your tablet display to your Fire TV with Kindle Fire, as well as other Miracast-enabled phones or tablets starting later this year. Fire TV supports standards like DIAL, so app developers can enable multi-screen experiences based on open technologies. Using Second Screen on your Fire HDX and later this year on your iPhone or iPad, you can see X-Ray information as your movie or TV show plays on Fire TV. With X-Ray you can see information about cast and crew, the names of songs as they play, as well as a list of all music in the movie or TV show, trivia items in context with the action on the screen, and character backstories so you can easily remind yourself of the character’s history. X-Ray is exclusive to Amazon and is powered by IMDb. Now you don’t have to worry about what your kids are watching on the TV—with FreeTime, a parent creates profiles for each child and selects the content they can see. Parents can create time limits based on type of content or time of day. When in FreeTime, the background color and fonts change to a kid-friendly design. Kids only see titles that have been selected by their parents for them, and those who can’t yet read can navigate visually to content based on favorite characters or topics—for example “Dora the Explorer,” “Princesses,” or “Thomas and Friends.” Parents who have already set up profiles and approved content on Kindle Fire tablets will find the settings are automatically synchronized on Fire TV, making it simple and seamless to get started. Customers who subscribe to FreeTime Unlimited—Amazon’s all-you-can-eat content subscription designed just for kids ages 3 to 8—will get unlimited access to thousands of movies and TV shows. FreeTime Unlimited is available for Prime members to enjoy for a monthly price of $2.99 per child or $6.99 per family. Customers who are not yet Prime members can subscribe to FreeTime Unlimited for a monthly price of $4.99 per child or $9.99 per family. Amazon FreeTime and FreeTime Unlimited will be available on Fire TV starting next month. Fire TV makes it easy to view your photos and personal videos on your TV. You can set up and play slide shows, find specific photos, and choose your favorite album for the screen-saver on Fire TV. Photos or videos you take on your phone or tablet can be automatically uploaded to Amazon Cloud Drive, so they appear on your Fire TV within seconds. With Fire TV, you can listen to music from popular streaming services like Pandora, iHeartRadio, and TuneIn, and watch music videos from VEVO. Starting next month, you can also listen to your full collection of music through Amazon Cloud Player. Simply upload your music or purchase from Amazon and it will be stored automatically in your Cloud Player and available on Fire TV as well as on your phone or tablet. Lyrics display and scroll line-by-line automatically as the song plays, so you can follow along with songs. X-Ray for Music will be available starting next month. Amazon worked with game developers like EA, Disney, Gameloft, Ubisoft, Telltale, Mojang, 2K, and Sega to bring their games to Fire TV. Games available starting today include customer favorites like Minecraft, Monsters University, The Game of Life, The Walking Dead, NBA2K14, Asphalt 8, Riptide GP2, Despicable Me: Minion Rush, and more. Over 100 games are available starting today and optimized for Fire TV, with thousands of additional games coming next month with the Fire TV app, which brings controls for touch-enabled games. These are great games for such a small box and at such surprisingly low prices—the average price of paid games is $1.85. Fire TV also comes with access to Sev Zero, a new game built exclusively for Fire TV by Amazon Game Studios. Sev Zero is $6.99 and is available for free when you purchase the Fire game controller. Learn more: www.amazon.com/pr/SevZero. Fire TV runs the latest version of Fire OS “Mojito,” which is based on Android, so it’s simple for developers to port their services and games over to Fire TV. In addition to using the Fire TV remote and the Fire TV app available starting next month, you can also choose the Amazon Fire game controller, which enables more high-intensity and complex gaming with dual analog sticks and a complete assortment of controls. Simple and comfortable to use for hours, the Fire game controller pairs with Fire TV via Bluetooth. The Fire game controller also intelligently manages power by automatically going to sleep when not in use, and waking at a touch of a button, so you get up to 55 hours of gaming on a pair of AA batteries. You can pair multiple game controllers with a Fire TV so the whole family can play together in the same room. The integrated GameCircle button gives you instant access to leaderboards, achievements and friends with a simple touch of a button from any GameCircle enabled game. The Fire game controller can also be used as a remote, with fast forward, rewind, play and pause, so you can control all your movies and music on Fire TV. The Fire game controller is available today for $39.99, and comes with a free copy of Sev Zero and 1,000 Amazon Coins (a $10 value) for purchasing games. Whispersync—Amazon’s Whispersync technology saves and synchronizes your video and music library across all of your devices. Start watching a movie on your Kindle Fire or iPhone, and when you get home, pick up where you left off on your Fire TV. For games that support Whispersync, your place in the game will also sync across devices so you can always pick up where you left off. Watch on over 300 devices—When you buy a movie or TV show on Amazon, you can watch it on over 300 devices. Worry-Free Archive—Automatically backs up your Amazon digital content in the cloud so you never need to worry about losing your collection. Top-Rated, World-Class Customer Service—When a customer shops on Amazon, buys a Fire TV, or buys digital content from Amazon, they know that they are also getting Amazon’s world class customer service. Customers with a Kindle Fire HDX can also use the Mayday button to receive free, live, on-device tech support. Free Month of Amazon Prime—Amazon continues to invest hundreds of millions of dollars to bring Prime members new movies, TV shows, and books to enjoy at no additional cost. Prime members enjoy unlimited, commercial-free, instant streaming of tens of thousands of movies and TV episodes with Prime Instant Video. Eligible customers get a free 30-day trial of Amazon Prime when they purchase Fire TV. Fire TV is available starting today for just $99—order at www.amazon.com/FireTV. Eligible customers get a free 30-day trial of Netflix and Amazon Prime when they purchase Fire TV. Images of Fire TV are available at www.amazon.com/pr/devicesandcontent. Amazon.com, Inc. (NASDAQ: AMZN), a Fortune 500 company based in Seattle, opened on the World Wide Web in July 1995 and today offers Earth’s Biggest Selection. Amazon.com, Inc. seeks to be Earth’s most customer-centric company, where customers can find and discover anything they might want to buy online, and endeavors to offer its customers the lowest possible prices. Amazon.com and other sellers offer millions of unique new, refurbished and used items in categories such as Books; Movies, Music & Games; Digital Downloads; Electronics & Computers; Home & Garden; Toys, Kids & Baby; Grocery; Apparel, Shoes & Jewelry; Health & Beauty; Sports & Outdoors; and Tools, Auto & Industrial. Amazon Web Services provides Amazon’s developer customers with access to in-the-cloud infrastructure services based on Amazon’s own back-end technology platform, which developers can use to enable virtually any type of business. Amazon Fire TV is a tiny box that plugs into your HDTV for easy and instant access to Netflix, Prime Instant Video, Hulu Plus, WatchESPN, SHOWTIME, low-cost video rentals, and much more. Kindle Paperwhite is the world’s best-selling and most advanced e-reader. It features new display technology with higher contrast, the next generation built-in light, a faster processor, the latest touch technology, and exclusive new features designed from the ground up for readers. Kindle, the lightest and smallest Kindle, features improved fonts and faster page turns. The new Kindle Fire HDX features a stunning exclusive 7” or 8.9” HDX display, a quad-core 2.2 GHz processor, 2x more memory, and 11 hours of battery life, as well as exclusive new features of Fire OS 3.0 including X-Ray for Music, Second Screen, Prime Instant Video downloads, and the revolutionary new Mayday button. The all-new Kindle Fire HD includes an HD display, high-performance processor and dual speakers at a breakthrough price.